Have you ever found yourself screaming and wandered why nobody around you seemed perturbed? wandered how the noise coming from the deepest part of your soul was not smashing everything made of glass within a 3 mile radius, how could the deafening sound around you not be stopping the world in its tracks. And then you realise the unimaginable and deafening sound consuming you is silent to everyone around you, no ear plugs or sound proofing will stop its frequency transmitting through every cell of your body. And no one can hear it. Over the noise rampaging through your head you attempt to speak but you cant hear your own words, let alone put them in a coherent sentence. And so people don’t ask awkward questions, they cross the street and they get on with their lives. As you read this I truly hope you have never heard the words ‘I’m so sorry, there’s nothing more we can do’, ‘I’m calling with bad news’ ‘He/she’s gone’ but if you have then maybe you have heard the silent scream too and maybe like me you realise just how important not crossing the street is. When I started the Sober October challenge for Macmillan Cancer support, I kept it light deliberately, made it about Chocolate Martini’s and lost Prosecco minutes, I did not want to disclose the full motivation for raising funds, everyone’s journey with Cancer is personal and I didn’t truly expect to lose two friends from the disease before the end of the year let alone before the end of the challenge. But as I write listening to & watching https://www.standuptocancer.org.uk/ I am deeply saddened to have lost two unique people from my life, one was a Pilates teacher I had not met but through the positive power of Facebook we connected, sometimes just a word, sometimes just a sentence or two but enough sometimes to go,’I’m here’, ‘you are not alone’. The other was a young woman I had taught for several years in my classes in London. Any teacher will tell you there are always people you teach that change the energy and dynamic of a class, they bring lightness, humour and enthusiasm as well as a love for Pilates that is contagious. They make you a better Teacher. When she contacted me to update me on her Cancer diagnoses at the beginning of term I knew it was bad, she was frustrated that Chemotherapy would make classes impossible but I had my new studio she hadn’t seen so I suggested if classes weren’t an option she could come to me, no charge just a chance to breathe, and maybe even leave the Cancer behind for just a little while. We had our session, she was relieved to see the Cadillac as getting to the floor had become exhausting and difficult for this once powerful runner. We laughed, stretched and breathed. Pilates was not the 100’s, it was not dynamic and it wasn’t sweaty but it was full of energy and love of the Method she brought so much joy to. She left brighter and pencilled in the next date, sadly the call I took yesterday from her husband reminded me that time is never guaranteed. The space this young woman carved in my class and my life will never be replaced. No matter how many clients, friends and family I have lost, the sound is no less deafening with each one. 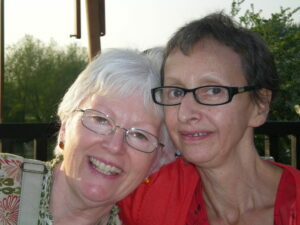 In memory of Lida, a long battle well fought and my mum’s best friend for over 30 years. So as my mother, myself, my husband and friends invent new ways to enjoy Vodka Martinis without the vodka for the month of October, we will remember those we have lost and loved. We will stand alongside our friends fighting their battles with this indiscriminate disease. We will answer awkward questions, we will talk openly about bucket lists that should be lived before our best before date expires. We will talk about how we want to live and die. We will raise funds in all sorts of weird and wonderful ways to support research into stopping Cancer in its tracks. (Just in case you would like to donate to my efforts please go to http://www.gosober.org.uk/users/suzy-gibbons-mitchell We will talk about breasts, testicles, rectums, lumps and bumps and all things body parts, we will talk about screening, vaccines and lifestyle choices that might improve our odds to live not only long lives but healthy, active ones. We will choose to fight. We will never cross the road because we don’t know what to say. Time may not be on our side but love, compassion, joy and the choice to live life today is.